Standing at a height of five feet, the imposing bass psaltery is one of a kind. Made of cherry and Sitka spruce, the 35-string psaltery features a Gothic rose sound hole intricately carved from wood and parchment. Psalteries, which are far smaller than this bass psaltery, date back to Babylonian and Sumerian times. They were also played during the Middle Ages. Premier luthier Edward Turner made Winter Harp's bass psaltery and much smaller alto psaltery. Where did the concept of a bass psaltery come from? In 1998, Winter Harp Director Lori Pappajohn was looking for someone to make rare medieval instruments. She was delighted to discover this award-winning luthier whose works are found throughout the world. Lori had a specific instrument in mind, one that didn't exist, but could if someone was adventurous enough to take on the task of making it. She wanted a deep-voiced psaltery. Based on her concept, Edward Turner designed a five-foot tall bass psaltery. Its 35 strings produce a haunting, ethereal sound. For hundreds of years, the medieval organistrum was almost lost to history. But in the 1970s Canadian instrument maker Edward Turner made one of the first organistrums of the 20th century. That instrument is in the collection of the Canadian Museum of History in Ottawa. When Winter Harp Director Lori Pappajohn learned of this instrument, she commissioned Edward Turner to make a second one. Mr. Turner's organistrum is a replica based on a stone carving on the frieze over the entrance of the 12th century Cathedral of Santiago de Compostela in Spain. Elaborately carved, the organistrum takes two people to play. One person turns the wheel to produce the drone sound while the other person turns the pegs to produce the different notes. It is the grandfather of the hurdy-gurdy, also known as the Vielle a Roue. The organistrum's guitar-shaped box has a square key box attached to it that has movable vanes which stop the strings at pre-determined intervals, making the different notes of a melody. A wooden rosined wheel "bows" the strings. Not all the strings are stopped, thus giving a bagpipe-like droning effect. The origins of the instrument are lost in the mists of time. The earliest known construction methods were recorded by Odo of Cluny in 10th century France. The hurdy-gurdy's sound is produced by turning a crank attached to a rosined wheel that rubs against the strings. The wheel acts much like a violin bow. Melodies are played on a keyboard that presses tangents, small wedges, typically made of wood, against one or more of the strings to change their pitch. Most hurdy-gurdies have multiple drone strings, resulting in a sound similar to bagpipes. For this reason the hurdy-gurdy is often used interchangeably with bagpipes. 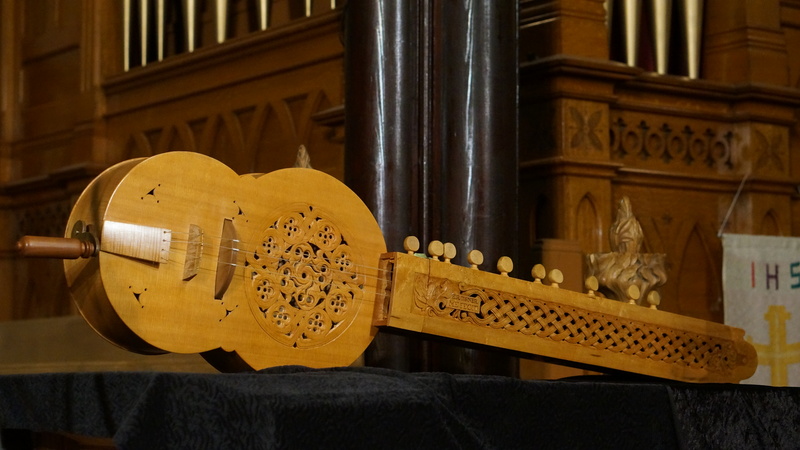 Jeff Pelletier's hurdy-gurdy was custom made for him by Altarwind Music in Oregon. It is La Priel de Moncur (the Pearl of My Heart) hurdy-gurdy. 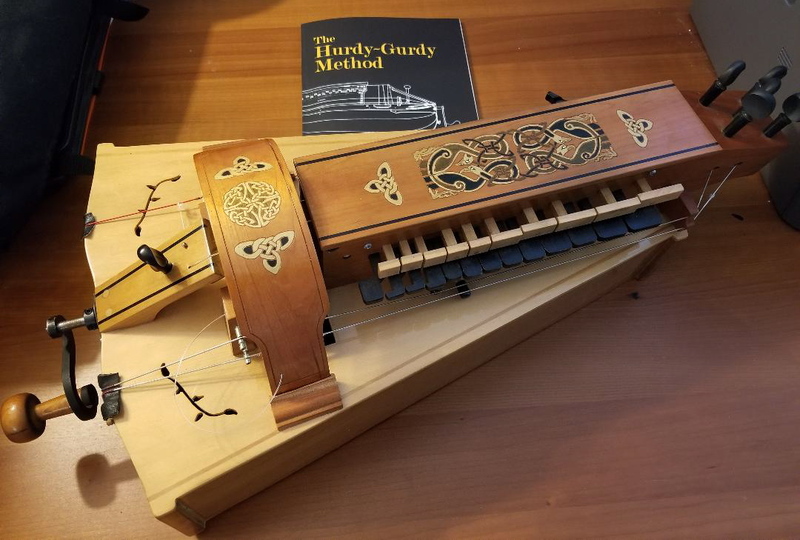 The hurdy-gurdy has its origins in the organistrum which is first mentioned in 12th century Europe. The organistrum was later made smaller and more versatile, becoming the hurdy-gurdy. It was played throughout Europe during the Middle Ages and the Renaissance. This unique instrument, with its wistful sound, was replaced after medieval times by the violin. However, it is still played in Sweden and is experiencing a revival in Europe and North America. The nyckelharpa is a combination of a violin and a hurdy-gurdy. Its four strings are bowed like a violin, while the melody is made using keys like a hurdy-gurdy. Its name means keyed (nyckel) stringed instrument (harpa). Underneath its four bowed strings are 12 sympathetic strings which give the instrument its rich resonant tone. The nyckelharpa dates back to the 1300s.